Mercury is the closest planet to our Sun, but it also has the most eccentric orbit (0.2056) of any of the Solar Planets. This means that while its average distance (semi-major axis) from the Sun is 57,909,050 km (35,983,015 mi) or 0.387 AUs, this ranges considerably – from 46,001,200 km (2,8583,820 mi) at perihelion (closet) to 69,816,900 km (43,382,210 mi) at aphelion (farthest). A trio of NASA’s Planetary Science mission’s – Mars Science Laboratory (MSL), Dawn and MESSENGER – has been honored by Popular Science magazine and selected as ‘Best of What’s New’ in innovation in 2011 in the aviation and space category. The Curiosity Mars Science Laboratory was just launched to the Red Planet on Saturday, Nov. 26 and will search for signs of life while traversing around layered terrain at Gale Crater. Dawn just arrived in orbit around Asteroid Vesta in July 2011. MESSENGER achieved orbit around Planet Mercury in March 2011. Several of the top mission scientists and engineers provided exclusive comments about the Popular Science recognitions to Universe Today – below. “Of course we are all very pleased by this selection,” Prof. Chris Russell, Dawn Principal Investigator, of UCLA, told Universe Today. Dawn is the first mission ever to specifically investigate the main Asteroid Belt between Mars and Jupiter and will orbit both Vesta and Ceres – a feat enabled solely thanks to the revolutionary ion propulsion system. “At the same time I must admit we are also not humble about it. Dawn is truly an amazing mission. A low cost mission, using NASA’s advanced technology to enormous scientific advantage. It is really, really a great mission,” Russell told me. Vesta is the second most massive asteroid and Dawn’s discoveries of a surprisingly dichotomous and battered world has vastly exceeded the team’s expectations. “Dawn is NASA at its best: ambitious, exciting, innovative, and productive,” Dr. Marc Rayman, Dawn’s Chief Engineer from the Jet Propulsion Lab (JPL), Pasadena, Calif., told Universe Today. JPL manages both Dawn and Mars Science Laboratory for NASA’s Science Mission Directorate in Washington, D.C. Dawn is an international science mission. The partners include the German Aerospace Center (DLR), the Max Planck Institute for Solar System Research, the Italian Space Agency and the Italian National Astrophysical Institute. “Very cool!”, John Grotzinger, the Mars Science Laboratory Project Scientist of the California Institute of Technology, told Universe Today. Last View of Curiosity Mars Science Laboratory Rover - inside the Cleanroom at KSC. Curiosity is using an unprecedented precision landing system to touch down inside the 154 km (96 miile) wide Gale Crater on Aug. 6, 2012. The crater exhibits exposures of phyllosilicates and other minerals that may have preserved evidence of ancient or extant Martian life and is dominated by a towering mountain. “It’s like a trip down the Grand Canyon 150 years ago, with the same sense of adventure, but with a lot of high tech equipment,” Grotzinger told me. MSL also has an international team of over 250 science investigators and instruments spread across the US, Europe and Russia. MESSENGER is the first probe to orbit Mercury and the one year primary mission was recently extended by NASA. Sean Solomon, of the Carnegie Institution of Washington, leads the MESSENGER mission as principal investigator. The Johns Hopkins University Applied Physics Laboratory built and operates the MESSENGER spacecraft for NASA. After its first Mercury solar day (176 Earth days) in orbit, MESSENGER has nearly completed two of its main global imaging campaigns: a monochrome map at 250 m/pixel and an eight-color, 1-km/pixel color map. Apart from small gaps, which will be filled in during the next solar day, these global maps now provide uniform lighting conditions ideal for assessing the form of Mercury’s surface features as well as the color and compositional variations across the planet. The orthographic views seen here, centered at 75° E longitude, are each mosaics of thousands of individual images. At right, images taken through the wide-angle camera filters at 1000, 750, and 430 nm wavelength are displayed in red, green, and blue, respectively. NASA’s MESSENGER probe to Mercury, the scorched, innermost planet of our solar system, is sending back so much startling and revolutionary data and crystal clear images that the results are forcing scientists to toss out previously cherished theories and formulate new ones even as the results continues to pour in. And the mission has barely begun to explore Mercury’s inner secrets, exterior surface and atmospheric environment. MESSENGER became the first spacecraft ever to orbit planet Mercury on March 18, 2011 and has just completed the first quarter of its planned one year long mission – that’s the equivalent of one Mercury year. MESSENGER has collected a treasure trove of new data from the seven instruments onboard yielding a scientific bonanza; these include extensive global imagery, measurements of the planet’s surface chemical composition, topographic evidence for significant amounts of water ice, magnetic field and interactions with the solar wind, reported the science team at a press conference at NASA Headquarters. “MESSENGER has snapped over 20,000 images to date,” said Solomon, at up to 10 meters per pixel. The probe has also taken over two million laser-ranging topographic observations, discovered vast volcanic plains, measured the abundances of many key elements and confirmed that bursts of energetic particles in Mercury’s magnetosphere result from the interaction of the planets magnetic field with the solar wind. MESSENGER was launched in 2004 and the mission goal is to produce the first global scientific observations of Mercury and piece together the puzzle of how Mercury fits in with the origin and evolution of our solar system. There was very little prior imaging coverage of Mercury’s northern polar region. Color images of the whole planet – with a resolution of about 1 kilometer per pixel – tell the researchers about the chemical composition and rock types on Mercury’s surface. “We are very excited to study these huge volcanic deposits near the north pole with the implications for the evolution of Mercury’s crust and how it formed,” said Denevi. Determining whether Mercury harbors caches of polar water ice is another one of the many questions the MESSENGER science team hopes to answer. 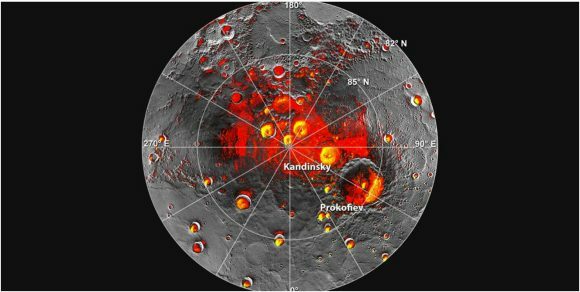 Two decades ago, Earth-based radar images showed deposits thought to consist of water ice near Mercury’s north and south poles. Researchers postulated a theory that these icy deposits are preserved on the cold, permanently shadowed floors of high-latitude impact craters, similar to those on Earth’s moon. Early results from topographic measurements are promising. “Stay tuned. As this mission evolves, we will be relying on the geochemical and remote sensing instruments which take time to collect observations. The neutron and gamma ray spectrometers have the ability to tell us the identity of these icy materials,” said Solomon. KENNEDY SPACE CENTER – 50 Years ago this week, Alan B. Shepard became the first American to be launched into space. Shepard blasted off on May 5, 1961 from Cape Canaveral, Florida. NASA and the US Postal Service honored Shepard’s historic achievement today (May 4) at an Official First-Day-of-Issue dedication ceremony at NASA’s Kennedy Space Center in Florida. Alan Shepard was one of the seven Project Mercury astronauts – who will be collectively known for all eternity as – “The Original 7”. The US Postal Service simultaneously released two new 44 cent Forever Stamps at today’s commemoration, which bookend two historic space achievements – Shepard’s inaugural manned spaceflight aboard the Mercury capsule and NASA’s unmanned MESSENGER mission which recently became the first probe from Earth to achieve orbit about the Planet Mercury. Fellow Mercury Astronaut Scott Carpenter attended the ceremony and unveiled the stamps along with Steve Masse, United States Postal Service Vice President of Finance at the Rocket Garden at the KSC Visitor Complex. “Today we celebrate the 50th anniversary of many, many important issues, among them is the first steps from the home planet that were taken by the family of man,” said Carpenter. Although Shepards suborbital flight aboard the one man “Freedom 7” Mercury capsule lasted barely 15½ minutes, the flight ignited America’s Moon landing effort and propelled American Astronaut Neil Armstrong to become the first human to set foot on the moon on July 20, 1969 during the Apollo 11 mission – one of the crowning technological achievements of the 20th Century. The success of “Freedom 7” emboldened President John F. Kennedy to declare that America “should commit itself to achieving the goal, before this decade is out, of landing a man on the moon and returning him safely to the Earth,” just three weeks later on May 20. “That was largely a response to Alan’s success,” Carpenter told the crowd of assembled officials, journalists and visitors. Also on hand for the stamp dedication was Shepard’s daughter Laura Shepard Churchly; Charles Bolden, NASA Administrator and former shuttle astronaut; Bob Cabana, KSC Director and former shuttle astronaut; and Jim Adams, NASA deputy director, Planetary Science. Shepard’s tiny capsule measured just six feet by six feet, reached a maximum speed of 5,100 MPH, roughly eight times the speed of sound, and a zenith of 116 miles above the Earth. Freedom 7 was bolted atop a Redstone rocket that generated only 78,000 pounds of thrust, followed a ballistic arc and landed 300 miles down range in the ocean. “These stamps, which will go out by the millions across this country, are a testament to the thousands of NASA men and women who shared dreams of human spaceflight and enlarging our knowledge of the universe,” said Bolden. Shepard’s flight and MESSENGER both blasted off from launch pads quite close to one another at Cape Canaveral Air Force Station which is adjacent to the Kennedy Space Center. On Thursday May 5, watch for my on site coverage of NASA’s special ceremony marking the 50th Anniversary of Shepard’s milestone “Freedom 7” mission – and an interview with Scott Carpenter. Shepard’s mission came barely three weeks after Cosmonaut Yuri Gagarin became the first human to orbit the Earth. The bold flights of these brave Cosmonauts and Astronauts – backed by a few insightful political leaders – began the Era of Human Spaceflight. As the shuttle program winds to a close, the future of US Human Spaceflight is very uncertain. Here’s a Mercury diagram, showing the interior of planet Mercury. Mercury is the closest planet to the Sun, orbiting at an average distance of 57.9 million km from the Sun. It’s also the second densest planet in the Solar System, with an average distance of 5.427 grams per cubic centimeter. Based on this density, astronomers have some estimates about the interior structure of Mercury. The center of Mercury is its metal core, similar to the Earth’s core. But in the case of Mercury, the core occupies 42% of the volume of Mercury, while the core of Earth is only 17%. And for some reason, the metal core of Mercury doesn’t create a magnetic field with the same intensity of Earth’s magnetic field. 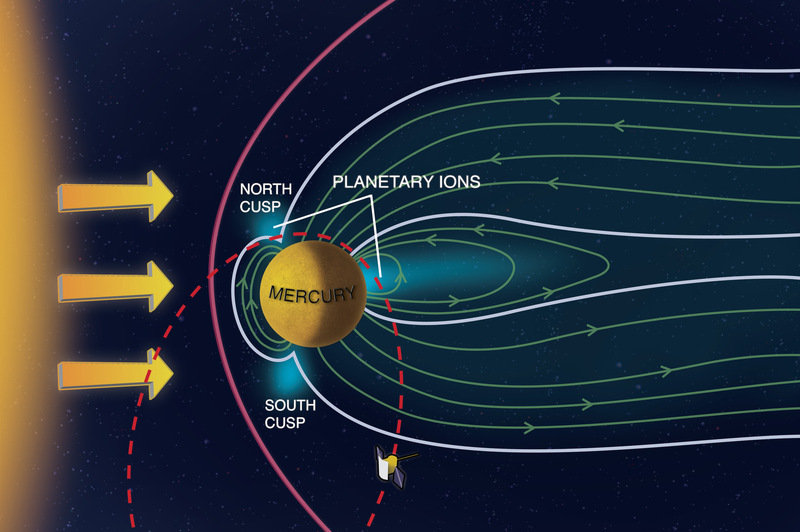 Mercury’s magnetosphere is only 1% as strong as Earth’s field. Surrounding the core is Mercury’s mantle. This is a 500-700 km thick layer of rock, composed of silicates. And surrounding the mantle is Mercury’s crust. Based on observations made by Mariner 10 and Earth-based telescopes, astronomers think that Mercury’s crust is 100 – 300 kilometers thick. There are many large depressions in Mercury’s crust, and scientists think these formed as Mercury slowly cooled and contracted. We’ve written many articles about Mercury for Universe Today. Here’s an article with a diagram of the Sun, and here’s a diagram of the Solar System. We’ve also recorded an episode of Astronomy Cast about Mercury. Listen here, Episode 49: Mercury. The length of year on Mercury is 87.969 days. In other words, it takes almost 88 Earth days for Mercury to complete one orbit around the Sun. Mercury completes just over 4 orbits for each year on Earth. Mercury has the most eccentric of all the orbits of the planets. Its distance from the Sun varies between 46 million and 70 million kilometers. This means that the speed of its orbit varies dramatically depending on the point of its orbit. If you could stand on the surface of Mercury and watch the Sun, you would see the Sun rise in the morning go part way up in to the sky and then go backwards in the sky, and set again. And then it would rise again and this time it would go across the sky and set. Four days before the fastest point of its orbit around the Sun, Mercury’s orbital speed matches its rotational velocity so that the Sun appears to stop in the sky. Then it’s orbiting faster than it’s rotating for about 8 days and so the Sun appears to move backwards. We’ve written several articles about the length of years for Universe Today. Here’s an article about the years of all the planets, and here’s an article about how long a year is on Mars. We’ve also recorded several episodes of Astronomy Cast about Mercury. Listen here, Episode 49: Mercury. In scientific terms, an orbital revolution is the amount of time it takes for one object to orbit completely around another. So a Mercury revolution is the amount of time it takes for Mercury to completely orbit the Sun and then come back to its initial position. Here on Earth, we call that a year. Mercury’s revolution around the Sun takes 87.969 days. So, you could say that Mercury’s year lasts almost 88 days. But if you were standing on the surface of Mercury, you wouldn’t experience that many days. That’s because Mercury rotates on its axis very slowly, taking almost 59 days to rotate once. The strange thing is that if you were standing on the surface of Mercury, you would experience something very different. You would see the sun rise halfway, and then go back down again, and then rise up again before setting. The whole process would take about 2 of Mercury’s years. Remember, the revolution of Mercury is how long the planet takes to travel around the Sun. The rotation of Mercury is how long it takes to turn once on its axis. We’ve written many articles about Mercury for Universe Today. Here’s an article about the gravity on Mercury, and here’s an article about the composition of Mercury. We’ve also recorded several episodes of Astronomy Cast about the Solar System. Listen here, Episode 49: Mercury. How Long Does it Take Mercury to Orbit the Sun? Mercury is the closest planet to the Sun, and so it’s the fastest to orbit the Sun. In fact, Mercury only takes 88 days to orbit the Sun. In other words, Mercury’s orbit only takes 24% as long as Earth’s orbit. If you were born on Mercury, you would have celebrated 4 times as many birthdays as you do on Earth. In other words, if you’re 10 here on Earth, you’d be 40 in Mercury years. Now that’s a possible way to grow up more quickly. Mercury orbits the Sun at an average distance of only 57.9 million km. Compare this with Earth’s average orbital distance of 150 million km. Unlike the other planets in the Solar System, Mercury doesn’t really experience any seasons. This is because Mercury has no atmosphere to trap heat from the Sun. Whichever side of Mercury is currently facing the Sun experience temperatures of up to 700 Kelvin. And then the side of the planet that’s in the shade dips down to only 100 Kelvin; that’s well below freezing. Even though Mercury is close, you would experience incredibly cold temperatures if you lived on the surface. The orbit of Mercury was actually a great puzzle to astronomers until the 20th century. They couldn’t explain why the point of Mercury’s furthest orbit of the Sun was slowly drifting at a rate of 43 arcseconds per century. But this strange motion was finally explained perfectly by predictions made by Albert Einstein with his Theory of Relativity. We have written many articles about Mercury for Universe Today. Here’s an article about Mercury giving up more secrets to the MESSENGER spacecraft, and here’s a massive mosaic image of Mercury. We have also recorded an entire episode of Astronomy Cast just about Mercury. Listen here, Episode 49: Mercury. As one of the planets visible with the unaided eye, Mercury has been known before recorded history. But until the development of the telescope, the exploration of the Mercury was only unaided eye observations. Early cultures like the Mayans and ancient Greeks were diligent astronomers, and calculated the motions and positions of Mercury with tremendous accuracy. But the exploration of Mercury really began with the invention of the telescope. Galileo Galilei was the first to turn his telescope on the 1st planet, seeing nothing more than a small disk. Galileo’s telescope wasn’t powerful enough to see that Mercury has phases, like the Moon and Venus. In 1631, Pierre Gassendi made the first observations of Mercury’s transit across the surface of the Sun, and further observations by Giovanni Zupi revealed its phases. This helped astronomers to conclude the Mercury orbited the Sun, and not the Earth. Because Mercury is so small, and located so close to the Sun, astronomers weren’t able image features on its surface with any accuracy. It wasn’t until the 1960s, when Soviet scientists bounced radio signals off the surface of Mercury that astronomers got any sense of what its surface was like. These radio reflections also helped astronomers discover that Mercury’s day length is 59 days; almost as long as its year of 88 days. But the best Mercury exploration happened when NASA’s Mariner 10 spacecraft first flew past Mercury in 1974. It revealed that Mercury’s surface is pockmarked with craters like the Earth’s moon. And like the Moon it has flat regions filled in with lava flows. After two additional flybys Mariner 10 ended up mapping only 45% of Mercury’s surface. The next mission to explore Mercury was NASA’s MESSENGER spacecraft, launched on August 3, 2004. It made its first Mercury flyby on January 14, 2008, mapping more of Mercury’s surface. MESSENGER will eventually go into orbit around Mercury, mapping its surface in great detail and answering many unknown questions about Mercury and its history. We have written many stories about Mercury here on Universe Today. Here’s an article about a the discovery that Mercury’s core is liquid. And how Mercury is actually less like the Moon than previously believed. Want more information on Mercury? Here’s a link to NASA’s MESSENGER Misson Page, and here’s NASA’s Solar System Exploration Guide to Mercury.